Why have Western and Indian experts studied the Harappan civilisation? If your point refers to Harappa civilization, this civilization represents 600 years of a past when human endeavour succeeded in building cities, in sailing overseas to foreign cities, in mastering some basic techniques of metallurgy, in firing pastes and powdered stone and glazing surfaces, and so on. Some of their discoveries , such as granulation of gold ornaments, had almost to be reinvented in the twentieth century. So it was not a past of small communities and quaint practices –people tend to place greater value on the complex thing, long distances, intricate technology, etc. than on a life of few wants and simple ways of fulfilling those wants. FInally the Harappan world was, like those of Mesopotamia-Elam, Egypt, the manifestation of a great river-valley civilization. Pakistani archaeologists too have researched the civilization, as the Indus river flows through their country. Indians nowadays are exploring and digging sites mainly on the Indo-Gangetic divide east of the Sutlej (Haryana, Rajasthan) and the regions of Kutch and Saurashtra, as also north Gujarat. It is wrong, incidentally, to say that Pakistanis are “not interested in” Harappan archaeology. If the point of the question is “Western and Indian experts” the question becomes more interesting. Each body of scholarship, according to the intellectual and political context in which it produces knowledge, bears the imprint of its own self-evaluation, its resources, and its own intellectual tradition. Simply put, we take our cultural baggage along with us when we research a society that is not our own. (a) The pioneering research on the river valley civilizations was carried out by “Western” archaeologists working for the respective colonial regimes. It was they who set the agenda, --and they continue to do so because of the nature of globalisation. Many American and European archaeologists working on the Harappa civilization believe they know it all. If an American wishes to go into the field for a particular purpose, she will go to American authorities (Among Europeans this tendency is less marked, I think.) On the whole I can think of 3 recent books on the Harappa civilization, like ones which promote a “peace-nik” interpretation of the culture, which also lack knowledge of what is being done in India, or of Pakistani interpretations. (b) As for “Indian” research interests, much of these are linked to “heritage” and thereby of presenting sites like Lothal to the tourist: questions of snack-stalls, parking lots, toilets, etc take precedence over the local museum and its holdings. Somehow, heritage translates into “us”: Sindhi mithaiwalas will assure you that their halwa is as authentic as it was when eaten in Mohenjo-daro; Sindhis see the origins of their own diasporas as beginning in Harappan times…. This is relatively innocent, if inaccurate. But dare you say that Harappan technology borrowed this or that from another culture, you will be condemned. Worse, you will find statements that the drains of Mohenjo-daro are testimony to the prevalence of untouchability—because if there were no one to clean them out, the system would have been unworkable. This is a way of sayin g that untouchability is as old as Indian urbanism, and therefore, essential to being “Indian”. If we believe such a thing, shame on us. There is also the hard reality that we Indians suffer from low self-esteem. Archaeologists cringe before their Western colleagues, complain about lack of funds, jump to invitations to foreign conferences to read the same paper for the third time. It is an open secret that American archaeologists have been heard to declare that their Indian colleagues can be bought. However, I think Indians today, at least those coming from abroad and born 2nd and 3rd generation – they have no low self-esteem and are getting into the field. How many Indians do you know who specialize in cuneiform or in the Anatolian bronze age (forget Inca archaeology)? I once asked a European historian of India—who saw nothing wrong with the existing “division of labour” –if he would urge an Indian student to work on the European bronze age. Were not Indians slotted into Indian studies, Iraqis into cuneiform, and so on, whereas Europeans were free to roam the world? The answer I got from this scholar was that he had not thought about this. Because the present states of India and Pakistan gather ca. one third of the world's population, and understanding the roots of their ancient civilisation would fill an enormous gap in the world's history. It is one of the earliest civilizations of the world, and an important monument in the history of mankind, fundamental for the subsequent culture of the Indian subcontinent. 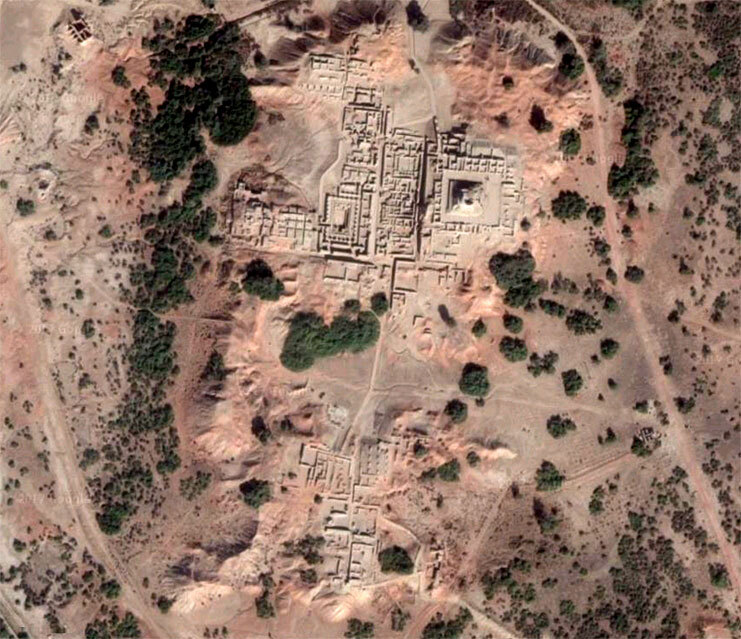 Above: Mohenjo-daro from the air, courtesy Google satellite view.